With over forty films to her name, including Welcome to the Rileys, The Mist, Waiting, Into the Wild, The Runaways, the currently shooting Catch .44, as well as The Twilight Saga Films, Robin Mathews has become a household name with Kristen Stewart Fans especially. Even with her very busy shooting schedule Robin took some time out to answer some questions from fans and also send some pictures from her personal photo collection which she captioned herself. Melissa cracking me up in the make-up trailer on WTTR- if you look closely, behind my left shoulder on the wall, you can see the photo I mentioned that Jake gave me as the inspiration for Mallory. Applying Kristen's make-up in the make-up trailer for Eclipse. 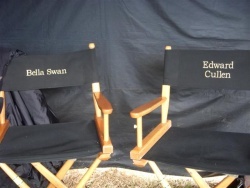 A treat for the fans from the set of New Moon. Kristen, Peter and me, awaiting to apply blood, on the set of New Moon (photo credit: Kimberly French/Summit Ent.). 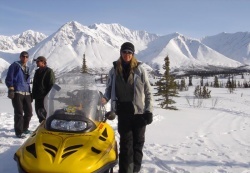 Me standing with my transportation on the set of Into the Wild. When doing Kristen's make up for Welcome to the Rileys, had there always been a specific look you wanted to incorporate into the film? Jake is very visually creative. He’s also an artist. (It’s actually his hands you see when Lois is painting in the movie). He had this beautiful photograph of a young European girl he found. She was sad but had much depth in her eyes. I put it up on the wall of the make-up trailer as reference for what Mallory would look like. Of course the look of the character developed further as Kristen and I worked on it. She had to learn how to pole dance for the role and had been practicing every day before we started shooting, and as a result, was covered in huge bruises. Because that’s what really happened from her pole dancing, of course we wanted to keep it in the movie. People forget that we shoot movies “out of sequence” of real life, so I had to re-create the bruises everyday to make them look the same once they had faded. The other huge influence for Mallory’s look was the real strippers in New Orleans that worked at the club where Mallory was supposed to work. This was no high end club by any means. (It’s the real club that you see in the movie but we actually cleaned it up a bit for the shoot!) The girls that worked there are rough, really rough. They are real prostitutes, runaways, transvestites. Kristen and I (separately) both spent time with these girls researching them. I took my key make-up artist with me and we just hung out in those clubs for a few nights in a row. I had to tip the girls for most of them to talk to me at first because they were not giving anything up for free, even time just talking about themselves. After they got to know me, they told me their stories, told me about their pimps; they let me take photos of them, their tattoos, etc. It was amazing research, and it showed us just how far we had to go to make Mallory realistic, exactly how rough we had to make her look. As you can see we made her look as though she never ate properly, made her look dirty and as though she never washed her make-up off, just piled more on top. I added acne, a rash around her lips, circles under her eyes, old cutting scars on her arms, and of course those bruises. How involved were Kristen and Jake and the other actors with the creation of the looks? 100% involved. For Mallory, Kristen came up with some of the ideas, Jake contributed some, and I came up with some, but we all bounced the ideas off one another other and decided upon the final look together. The same goes for the other characters in the film. Melissa’s character of Lois really makes a life changing transition in the film and Jake really wanted that to show physically. Lois’ make-up in the film actually had a story line and character arc all of its own. It really did! During Make-up tests, we played around with Jim/ Doug having a moustache or a goatee. We tested different shapes, but in the end, decided to go without facial hair. How did you become involved with Welcome to the Rileys? I interviewed with Jake in Los Angeles. I had worked for his commercial/ music video company before, but had never met him. He’s a wonderful man. His 4 dogs were there at his office too and I think they were interviewing me also. I’m sure I passed the doggie’s interview as I am a HUGE animal lover! I sat for about an hour and a half and played with the dogs and chatted with Jake about all kinds of stuff, the world in general, whatever, not just about the movie. It was very low key and comfortable. Of course Jim Gandolfini and I had worked together before and we’re good friends and I had worked with Kristen previously too, on Into the Wild. What was it like to work in New Orleans? Where you able to draw any inspiration from it? I was actually born and raised in New Orleans before moving to Los Angeles in my 20’s, so it is a huge part of who I am. I’ve been lucky enough to travel all over for my work and I’ve never seen another city in the United States remotely close to New Orleans. It’s very European. I recently watched an interview with Brian Williams (the national evening news anchor) who said the first time he landed in New Orleans, the pilot announced “Welcome to New Orleans! You’re not in the United States anymore”. That couldn’t be truer. I’m lucky enough now to be able to maintain a home there as well as my home in Los Angeles, so I spend as much time in New Orleans as I can. I loved that Jake kept the real influence of Katrina in the film. Malory’s house was a real house in the Bywater section of New Orleans that had been flooded by Katrina and was still slowly undergoing renovations. The “Katrina X” on the front of the house that was marked by rescue workers to tell whether anyone was found dead in the house was real. It inspired me to make a “Katrina X” tattoo for the character “Tiffany” in the film. It’s on the back of her shoulder. If you look closely at her tattoo, you can see the code the rescue workers used that tells you 1 person was found dead. Well, we use different products for different characters. We don’t base her make-up on what her (or my) favorite products are; we use what is necessary to create the character. Journalists also ask me this question a lot and I’ll always share what my favorite products are, but I feel Kristen’s favorite products are her story to tell. Again, it depends on what the charterer’s look calls for. Although I do use an actual make-up primer on many of the make-up applications I do, I believe on Kristen, it’s mostly been moisturizer, which is actually a “make-up primer” in a way as it is priming the skin for make-up application. Coming up with Mallory’s “work” make-up look for when she was going to the club was fun. That was actually one of the ideas that I came up with. Knowing Mallory was only 15, didn’t know much about make-up and didn’t really care to put much effort into it, we figured she would just smear a bunch of black eyeliner around her eyes and clump on tons of mascara. There are these iridescent powders I had used before that look white at first but when you layer them on top of another color such as black, they become this super pigmented neon bright color. So, Mallory would smear one of these on top of the many layers of her regular black liner and mascara and that was her big make-up effort. I vividly remember one of the real stripper/ prostitutes I met during my research in the French Quarter that had shaved all of her hair and eyebrows off. Everyday, she’d pick a super bright color eyeliner and use it to draw on crazy fake eyebrows and eyeliner that came to a vampiric point in the inside corner. The day I met her, it was a bright electric blue. Yes, I do use brown mascara sometimes for a more natural look if that’s what the character calls for. I don’t recall ever using it on Kristen, however; definitely not on WTTR, The Twilight movies or The Runaways. Yes, sometimes she does, especially the skincare I give her, but again, I really I feel Kristen’s favorite products are her story to tell. What is the most memorable moment you have had while doing a celebrity's makeup? Gosh, that’s a hard one. So many memories! I’d say the whole experience of shooting Into the Wild was extremely unique and memorable in every way. How long have you been doing Kristen's makeup? As I mentioned before, I first met Kristen when I was working for Sean Penn. I was the Make-Up Department Head for his movie Into the Wild and Kristen played Emile Hirsh’s friend/admirer “Tracy”. Kristen was 15 at the time. We met up again in 2008, for Welcome to the Rileys. Kristen shot some of her scenes and had to leave for a few weeks to do press for Twilight, which came out while we were shooting Rileys. As I remember it, when she came back, that was the beginning of the end of her being able to walk around without being mobbed by fans. It seemed like she left as a regular girl and came back as the exact same regular girl but with the whole world watching her every move. Somewhere in that time period, Kristen asked me to be her personal make-up artist, and a few months later, we were in Vancouver starting New Moon. A week after leaving Italy, The Runaways and Eclipse followed back to back in what was a very busy year for us. 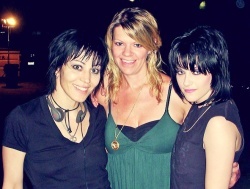 Was it crazy when Kristen was going back and forth from Eclipse to The Runaways? YESSS. We weren’t going back and forth but they were only a few days apart. It was a bit of a whirlwind, but that’s what we do for a living. We’re used to it. What colors look best with Kristen's skin coloring? She can pretty much pull anything off. Any special makeup tricks you do on Kristen? What is the makeup evolution for Kristen on each movie? I’ve mentioned before that she’s a total chameleon with her looks in movies and she is. Look at photos of her from Eclipse, The Runaways, Welcome to the Rileys, and her in real life and tell me another actress that’s physically has transformed in her roles like that in a 2 year period of time. Is it hard to keep her looking like she hasn't aged at all? Assuming you mean in the Twilight movies? Kristen’s look has actually aged in perfect unison with Bella’s. As the movies have been shot over the past 2 years, Kristen’s naturally transformed as Bella has. If anything, She and I’ve made a concerted effort to show Bella maturing throughout the movies, as maturity isn’t just about a number, it’s about growing in wisdom, experience, and confidence in yourself. How does she manage keeping her skin so flawless, working such long and hard hours on the set and jetsetting around the world? She has me… I kid! I kid!! What do you think of Kristen's new hairdo? What was the most exciting thing about being on the set of Eclipse?